A few weeks back, I sat in a booth at Youth Radio and looked up a website called Emoji Tracker. It shows you how people are using emojis — the little cartoon pictures you see on Twitter. When I pulled up the website, there were so many emojis I had never even heard of before. But there was one emoji in particular I wanted to track, so I scanned the website’s grid full of flashing cartoon pictures until I found it — the gun emoji. Out of the nearly 900 emoji options available to U.S. teenagers, the gun is one of the most popular, ranking in the top ten percent. But lately, the gun emoji has been landing some people in hot water. This past week, The Houston Rockets used a gun emoji in a tweet they aimed at the Dallas Mavericks, just before knocking them out of the playoffs. The Rockets later apologized and fired their social media manager. Young people tend to be savvier about these things. But there’s still room for misunderstanding. 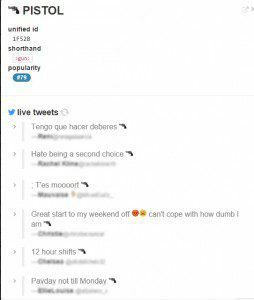 A sample of tweets that use the gun emoji, via emojitracker.com. As I watched the list of twitter messages pop up in real time, it was obvious that a lot of them were written by teenagers. There were messages like “I hate school” and “No one better mess with me” next to a tiny gray pistol. 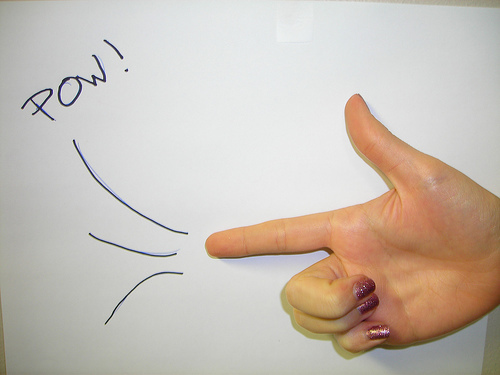 But it wasn’t always clear to me why people were using a picture of a gun to express themselves. Emojis may seem playful on a screen, but when you start to read into their meaning, things can get really serious. In January, a teenager in Brooklyn was arrested and charged with making terrorist threats for posting an emoji of a police officer next to a series of gun emojis. The charge was later dropped, but it just goes to show that it can be hard to tell what someone means by the gun emoji. Whatever other people think, he says it’s clear to him and his friends that it’s not violent. But the use of emojis as a supplement — and occasionally a replacement — for language is still evolving. She says that in general, emojis can be really useful for adding context to messages and tweets. A winky face to show you’re kidding, for example. 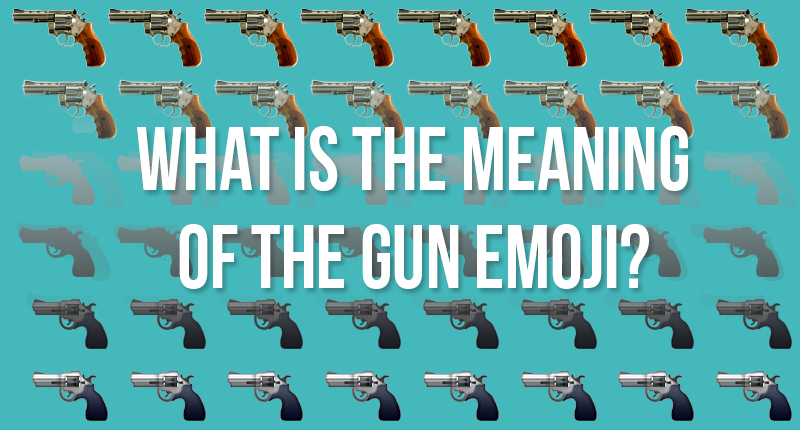 “But it may not be clear what [the gun emoji] conveys if someone isn’t fluent in emojis,” she said. The problem with the gun emoji, she explained, isn’t necessarily that it’s used too much. It may be that it isn’t used enough for people to agree on its meaning. Talking to my peers about the gun emoji, it seems like most young people use it as a joke. But all it takes is one person to misinterpret it and you’re in big trouble. So the way I see it, the next time you’re texting and your fingers hover over the gun emoji, if you’re not sure how someone will react to it — go with the frowny face.